The Bakersfield ARC's material recovery center is where half of the recyclables from Bakersfield homes and businesses ends up. Once it arrives, employees sort out items by material type. 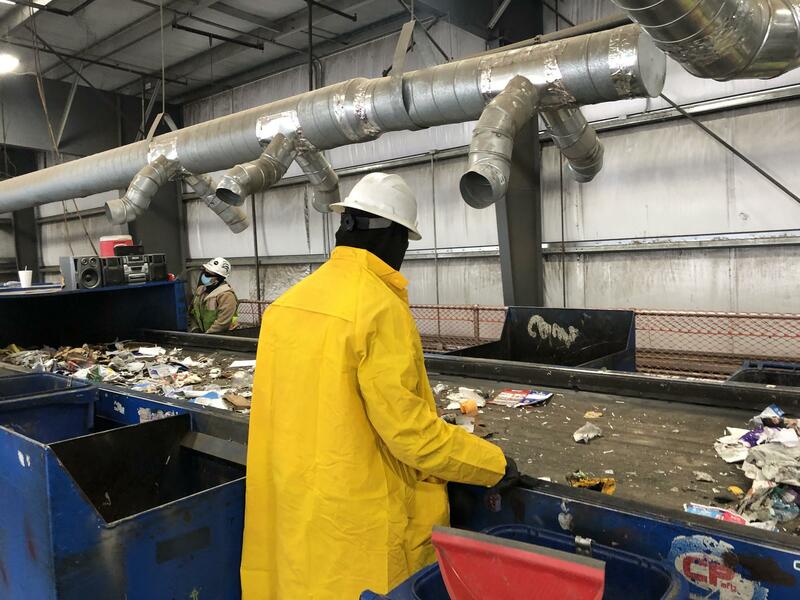 On the campus of the Bakersfield ARC, employees can work in a number of places, but one of the noisiest is the material recovery facility. It’s where about half of the city’s recycling is sorted by material. Just outside the warehouse, contents from the city’s blue bins have been dumped. A conveyor belt brings the recyclables inside, and up to a second floor platform. Workers stand along the conveyor belt, sorting items out by material. On a second floor balcony of the facility, employees are assigned a type of material to pull from the conveyor belt, like aluminum or cardboard. Most of the employees here have an intellectual or developmental disability, and they work with a supervisor. The Bakersfield ARC, or BARC, isn’t just a recycling facility. It’s a non-profit that assists, employs, and educates adults with developmental and intellectual disabilities. ARC used to stand for “Association for Retarded Citizens,” but the word, ‘retard’ is now considered a slur. The group and it’s national organization kept the acronym, ARC, as a name instead. BARC's employees, also called clients, have intellectual or developmental disabilities, which might mean a diagnosis of down syndrome, autism, cerebral palsy, epilepsy, or something else that affects their ability to work. Lisa Ackling is one client who’s been with BARC for 35 years. On days when Ackling works at the BARC campus, her tasks vary, but she doesn’t mind the inconsistency. 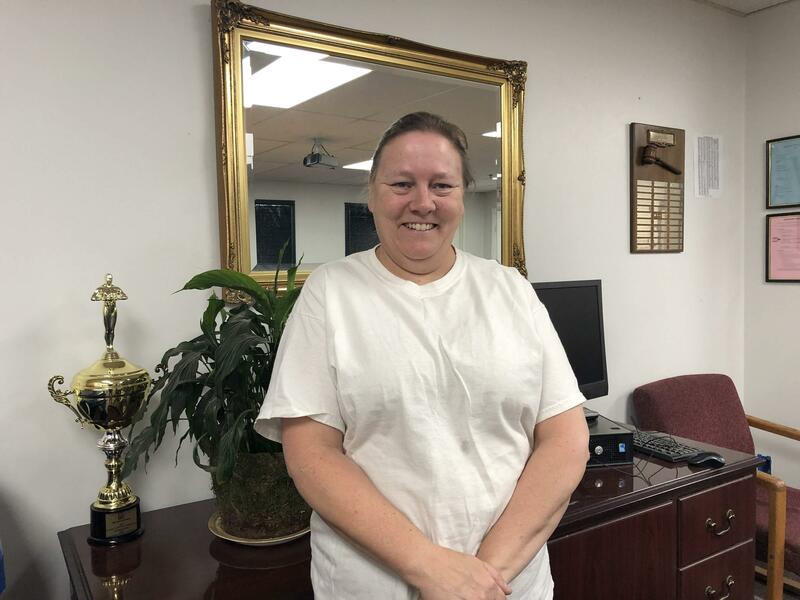 Lisa Ackling has worked at Bakersfield ARC for 35 years. She splits her work-week between a job at the facility, and a job at the nearby Ikea distribution center. “There's nothing I don't like. The only thing that I can't, well I can do it if I have to, is janitorial work and yard work and stuff cause of my allergies,” Ackling says. Part of how BARC does business is through a certification from the Department of Labor to pay employees by their productivity, which means clients may or may not work at minimum wage. BARC CEO Jim Baldwin explains that this happens through a provision in the federal Fair Labor Standards Act. While this practice is legal, some disability advocates argue that it isn’t fair to pay employees with disabilities less than anyone else. Connie Chu is with Disability Rights California. She isn’t familiar specifically with BARC, but she says the overall concern is that facilities exclusively employing workers with disabilities can be exploitative. “You know, for those of us that don’t have disabilities that impact our work, we know that day to day our productivity may really depend on our energy level, how we’re feeling that day, did we get enough rest, are we sick, and other things,” explains Chu. Chu adds that sometimes facilities employing people with disabilities segregate them from employees without disabilities, creating a “sheltered workshop”. In that space, Chu says clients learn how to work, but only in that environment, not in a competitive workplace. Despite these arguments, Jim Baldwin says that they are preparing their clients by giving them options outside their recycling facility and helping them find the best job fit. Like Lisa Ackling, who says the job has given her independence. She has money to spend on movie outings and travel, two of her favorite things. She also pays her own rent and manages her own money. Happy enough to continue working at BARC, at least for the time being. On this week’s Valley Edition: Valley Public Radio gets trashy. Do you ever think about what happens to all of your garbage and recyclables? Well, some California cities are getting creative. And what about all of that ridiculous stuff piling up in your garage? There’s a company that wants it. We also explore a recycling program in Bakersfield with some novel - and controversial - labor practices. Plus: Why is so much medical equipment thrown out before it’s expired? A Clovis organization is repurposing supplies from this enormous industry.